There were 171 entries to this bracelet contest via comments, Facebook and Twitter. And the person attached to that number is Lisha from The Lucky Mom. Because – and this is where life gets weird – I am going to New Orleans in about a week, and Lisha lives in a nearby suburb. We have been talking about getting together while I’m down there, and I think (I hope) I am actually going to meet her in real life! How crazy is that? I wish I had the bracelet so that I could deliver it personally to her door. Like they do with Publishers Clearinghouse Giveaway Sweepstakes. She would have been all “Who the hell are you?” excited, and it would have made for a great “How We Met” post. Hopefully, we’ll get our schedules to sync up so we can collaborate on something. So congratulations again to Lisha! Check out Lisha’s blog and follow her very popular Facebook Page. This entry was posted in When Life Doesn't Fit in a File Folder and tagged Charm bracelet, cute pictures, cutey jewellry, New Orleans. Bookmark the permalink. Oh, I love that you’re going to meet in real life! Love! In 1955 the RAND Corporation published a book titled “A Million Random Digits,” generating the million digits by means of a pulse generator, emitting 100,000 pulses per second, gated through a five-place binary counter, then passed through a binary-to-decimal converter, fed into an IBM punch, and printed by an IBM model 856 Cardatype. The process, we are told, took years. 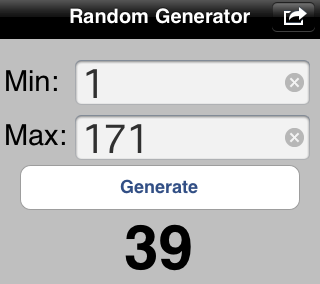 The little number generator that you used looks a lot simpler and easier to use. AWESOME! It’s Fate. And you could always hand her a picture of the bracelet. They are sending her a random selection! But their inventory is soooo cute, she can’t lose. Yes you! Congratulations! I wish I could bring it down to you in NOLA! Can’t wait to meet you next weekend! Squeee! Thanks! It is always exciting to see who the random generator will pick! I let my son do it. He loves it. I wish I could deliver in person. The bracelet is coming from the UK. I’m just excited to be able to meet Lisha! Beshert, right? I found you through the Lucky Mom. I am having fun visiting your blog. It is so awesome that you are going to New Orleans. I love NOLA! You could always join us, Deb!! What with next month’s trip to Chicago looming, I think I’ve used up my travel allotment for the next several months–but you can bet I’m going to tuck this into my brain for the future! MWAHAHAHA!